In 2003, the Sea Turtle Conservancy launched a cooperative project to protect hawksbill sea turtle nesting population at Chiriquí Beach in the Bocas del Toro Province of Panama. While the primary focus is the initiation of a long-term hawksbill monitoring and protection program at Chiriquí Beach, the project also included the satellite tracking of post-nesting females hawksbill sea turtles.Chiriquí Beach is a remote beach on Panama’s Caribbean shore was once described by Dr. Archie Carr as the most important nesting beach in the Caribbean for the “critically endangered” hawksbill turtle (Eretmochelys imbricata). However, by the 1980s and 1990s, sporadic aerial and ground surveys suggested that nesting had declined as much as 98% from previous levels (Meylan and Donnelly, 1999). The decline was attributed to the extensive harvest of nesting hawksbills to support the international trade in tortoiseshell. Although today’s nesting population is only a fraction of what it once was, there is increased optimism that depleted hawksbill populations can respond positively to long-term protection. This optimism is based on increased hawksbill nesting activity in recent years on well-protected beaches in Mexico, Barbados and Puerto Rico. This project is a cooperative effort under the direction of STC, with support and/or funding provided by U.S. Fish and Wildlife Service, Wildlife Conservation Society, the Panamanian wildlife authority (ANAM), the Florida Fish & Wildlife Conservation Comission’s Fish & Wildlife Research Institution, Eckerd College, National Marine Fisheries Service, National Fish and Wildlife Foundation, the University of Panama, APRORENAMB (a local conservation group in Panama), the International Fund for Animal Welfare, and the Smithsonian Tropical Research Institute. Learn more about the Chiriquí Beach Hawksbill and Leatherback Research and Conservation Program. MANDALAY II – Mandalay II (locally known as Berigo, the name of an important Nobe village), is an adult female hawksbill sea turtle that was encountered nesting on May 30, 2017, on Chiriquí Beach. She measured 86.6 cm in curved carapace (shell) length and 77.1 cm curved carapace width. She flipper tagged with tags #CH7627 and #CH7628 by STC researchers. A satellite tag was applied after she finished nesting. Mandalay II was named by her sponsor, Shark Reef Aquarium, and took part in the 2017 Tour de Turtles. Señorita Bedi is an adult female hawksbill turtle who nested on 6 July 2006 on Chiriqui Beach in Bocas del Toro Province, Panama. She was tagged with tags CH0349 and CH0350 by Cristina Ordoñez. The turtle measured 79.1 cm in straight carapace length. She was released with a satellite transmitter at 6:00 pm on July 7, 2006. MERY NA – Mery Na is an adult female hawksbill sea turtle and was encountered on the morning of November 9, 2005, in Beach Zone 10 of Chiriquí Beach, Panama. She was tagged with metal flipper tags #CH0430 and # Ch0431 and a satellite tag was applied. Señorita Chiriquí is an adult female hawksbill sea turtle that was encountered nesting on October 7, 2004, on Chiriquí Beach. She measured 83.0 cm in curved carapace (shell) length and was tagged with tags #CH0569 and #CH0568 by CCC researchers. A satellite tag, recovered from Merygö’s shell (see below), was applied after Señorita Chiriquí finished laying her nest of 189 eggs. Merygö is an adult female hawksbill sea turtle that was encountered nesting on September 6, 2004, at Chiriquí Beach. She measured 82.4 cm in curved carapace (shell) length and was tagged with tags #CH0314 and #CH0316 by CCC researchers. A satellite tag was applied after she finished laying her nest. UPDATE: Satellite data showed Merygö swimming northwest along the coast. Her final location signals were of very high quality and indicated no movement, suggesting that Merygö was on land. Wildlife Conservation Society researchers began a search of the islands in the last know location trying to determine her fate. On Sept 21st, 2004, they researchers confirmed that Merygö had been caught and eaten by an indigenous family living on Cayo de Agua, Panama. The turtle had been caught the day before at the southeastern end of Cayo de Agua. The transmitter was recovered and seems to be in good condition. STC attached the transmitter to another turtle, Señorita Chiriquí on October 7, 2005 (see above). Señorita Beche is an adult female hawksbill sea turtle that was encountered nesting on July 20, 2003, on Chiriquí Beach. She measured 85.8 cm in curved carapace (shell) length and was tagged with tags #CH0281 and #CH0282 by CCC researchers. A satellite tag (#21910) was applied after she finished laying over 100 eggs in a nest. Töbü Señorita Caña (Töbü is Ngöbe for hawksbill turtle that Señorita Caña means Miss Caña) is an adult female hawksbill sea turtle and was encountered nesting on July 16, 2003, on Chiriquí Beach. She measured 81.1 cm in curved carapace (shell) length and was tagged with tags #CH0230 and #CH0231 by CCC researchers. 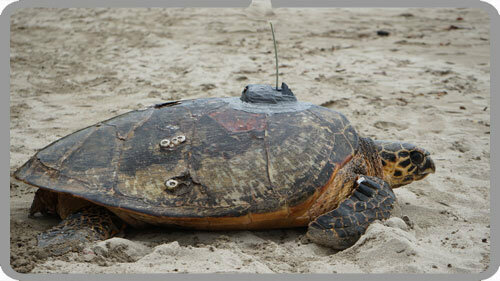 A satellite tag (#21911) was applied after she finished nesting.